“BABU! BABU! 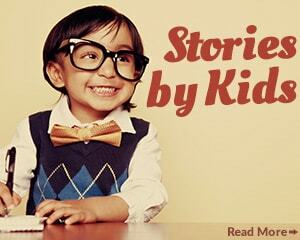 tell us a story ……. please! please!” they begged. The children hurriedly gather around kindly old Babu as he slowly gets off his bike and sits down cross-legged on the ground in the village square, getting himself comfortable before starting to tell one of his many stories. “Well children,” Babu said smiling at all the happy children’s faces staring up at him. “Today I will tell you all about Ravi. The rickshaw. The children clap their hands excitedly. “Ravi was a brand new rickshaw, all shiny and sparkly. Ravi was moving in the line of “just finished rickshaws” leaving the factory through a huge factory door, he looks excited, and can’t wait..
Ravi glimpses his reflection in a widow pane by his side, and stops. He thinks he’s beautiful, he smiles proudly, the rickshaw behind him beeps to push him on.. Finally the rickshaw behind Ravi gives him a little push, and Ravi finds himself in the middle of traffic, he collects himself, puffs out the dirt, puts on a very brave and competitive face, and putters along. He gathers a bit of courage and gives a little girl a ride, she gives him a compliment on his new look, he is over the moon now, he starts blowing his horn and singing along waving to people, and other rickshaws are slightly envious of his brand new shiny look. The crowds of people seemed to disappear into the houses and the shops and the streets were suddenly lit up by bright flashes of light with some very loud bangs. Poor Ravi was very frightened, he didn’t know what to do or where to go! A few minutes later, the flashes became brighter and brighter and the explosions got louder and louder and then, lots of big, heavy drops of water began to fall on him, blown by a very strong wind. The rain bounced off Ravi’s roof, making loud drumming noises and he felt more and more frightened and very lonely. what r u doing here?? Dear, dear, you’re going to catch a cold.. Here, here, don’t be afraid, I just get a little grumpy when I wake up that’s all. I am SRI the oldest truck in the city. What’s your name little one? Is this the first time for you in a monsoon? I don’t know sir, ww what’s a monsoon? Well, a monsoon is when we get big flashes of light in the sky called ‘lightning’ followed by loud bangs called ‘thunder’, together with lots of water called ‘rain’ . First you see the lightning, then you hear the thunder, then the rain comes. You know why we see the lightning before you hear it’s thunder noise? Ravi is engaged now, also feels safer despite the thunder and rain. No .. Sir, why is that? Because light travels faster than sound. You see before you hear. “Another interesting fact, when you see the lightning flash and count the seconds until you hear the thunder, this can tell you how far away the centre of the storm is. So, if it’s five seconds between the lightning and the thunder, then the storm is five miles away. Sri showing off ! Not only that, the most beautiful surprise after torrential rain is the fabulous rainbow which follows when the rain stops.. This is the most beautiful thing I’ve ever, ever, ever seen since I left home! Uhuh says Sri smiling endearingly. Well, yes and no.. The rain brings water that people need to wash with, grow their crops in the fields and cool everything down after the hot sun. BUT,(dramatically) if there is too much rain it can cause a flood. RAVI A flood??? What’s a flood?? Good Grief, you’re a curious little one RAVI. That’s another long story, perhaps some other day I tell you about the flood. I need to sleep now, I have to make a delivery very early tomorrow morning and I need to rest. until you find your own sleeping quarters..
Ravi snuggles between Sri’s wheels they both shut their eyes and start snoring gently. “Well, that was my story for today, children. Now, it’s time for you all to go home and I shall see you all again another day” said the wise old man, standing up and climbing back onto his bicycle. 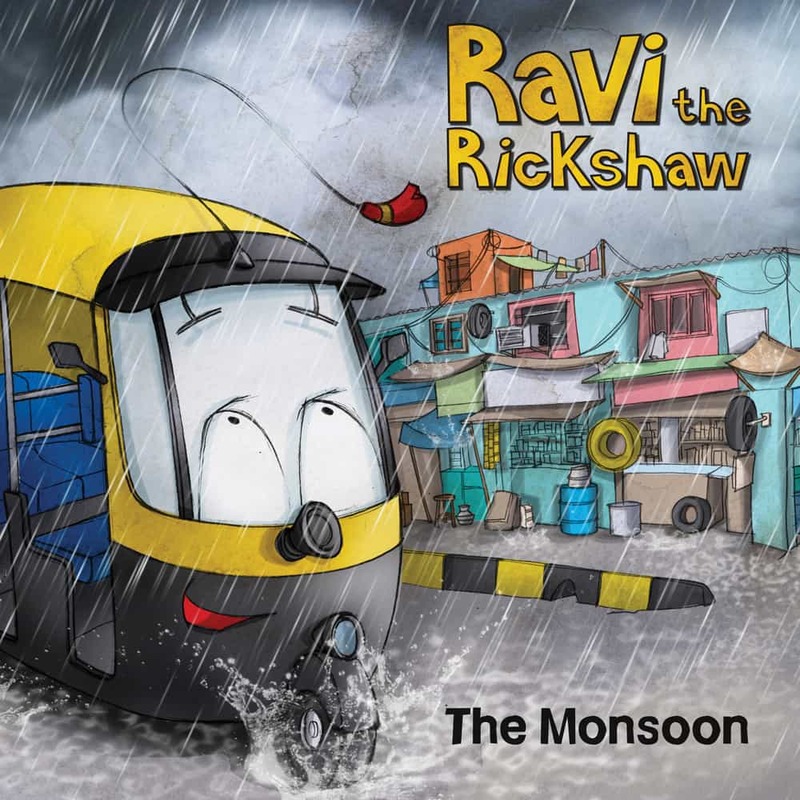 “Goodbye, Babu!” shouted the children as they ran off home, eager to tell their families all about Ravi the Rickshaw and monsoons. The old man cycles out of the village just as the sun is setting.